So today might be one of those posts, where not much is written in the actual post has to do with the recipe itself. 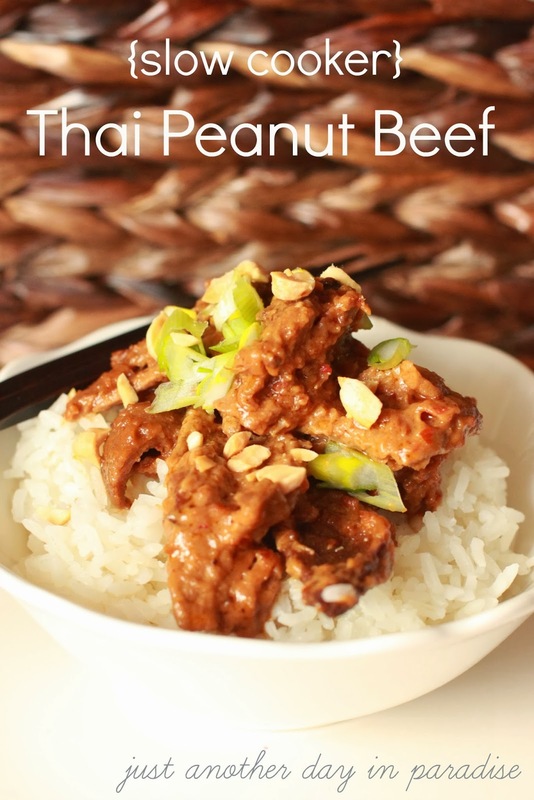 Don't get me wrong the Slow Cooker Thai Peanut Beef is super yummy. A little bowl of goodness. Sweet and savory, with just the right amount of spice. The beef and the peanut butter are kind of crazy together. Like long lost high school sweethearts who find each other after 20 years, and after finally reuniting run hand in hand through a field of daisies. Speaking of fields of daisy. I have the hand holding sweetheart thing taken care of. Alas, I do not have the field of daisies. Winter has been long. I am really excited to see some daisies. Heck, I would love to see a green blade of grass. That seems romantic, running hand in hand through blades of grass. Not really, so I take it back. I just want the daisies. 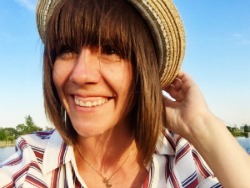 I am grateful for the sun. Luckily we do see it on a regular basis. So I'll try not to have a wah-fest about the still bitter temps. Glass half full. Or should it be bowl half full. Half full of Thai Peanut Beef, because you already scarfed down half of your serving. See how I did that. Thai Peanut Beef to daisies back to Thai Peanut Beef. Yeah, I am good like that. I am good like a big old bowl of Thai Peanut Beef. Haha! Guess I ended up talking more about this recipe then I thought I would. Couldn't be helped, it was just that good. Almost as good as running hand in hand with The Hubs through a field of daisies. I probably should point out that I can't actually see The Hubs running through a field of daisies. Mayhaps a stroll on the beach would have been a better and a little more manly. Basically, nothing is as good as running hand in hand anywhere with The Hubs. Ahhhhh. Yes, yes, very sweet. Sweet but true. Give the recipe a whirl. Then go running through a field of daisies. Okay I am all done with the daisies. Heat the oil in a saute pan over medium high heat. Sear the meat until browned, about 3-5 minutes. Drain the meat and put the meat in the slow cooker. Combine the beef broth, peanut butter, soy sauce, brown sugar, and chili garlic sauce in a bowl. Whisk everything together. Pour over the beef in the slow cooker. Cook on low for 4-5 hours. The sauce will be a little thicker and there will be some caramelized portions. Stir once more. 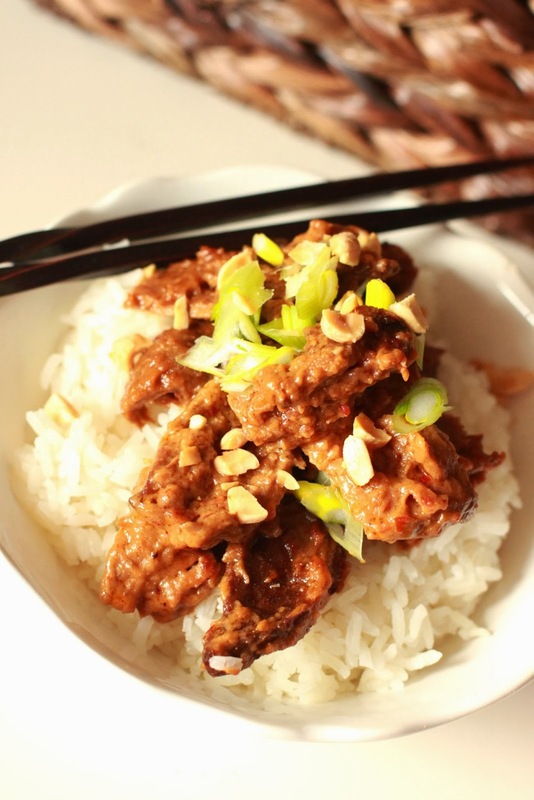 Serve over steamed rice and top with crushed peanuts and sliced green onions. I made your recipe tonight and it was delicious! And enough for tomorrow night's dinner! Definitely will make this again! thanks for posting! I wonder if it would work with chicken? Kat, I am so glad you liked it! I didn't even think of chicken. It is worth a try!